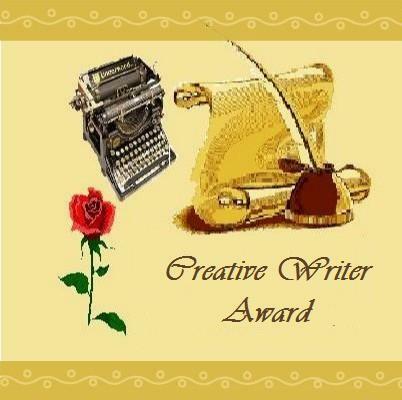 Please accept the ‘Creative Writer Award’ with no strings attached. You can post it within an awards page, sidebar, or new post; you can link it to me and pass it on to writers you know who host writing blogs, or you can simply read this note with my thanks attached and do nothing further. This is just intended as a gesture to further the premise ‘writer’ within ‘blogger.’ I’d love to see more writers acknowledged for the craft! Because we all are writers. Their posts and journeys have been both informative and inspiring to me for a long time now.